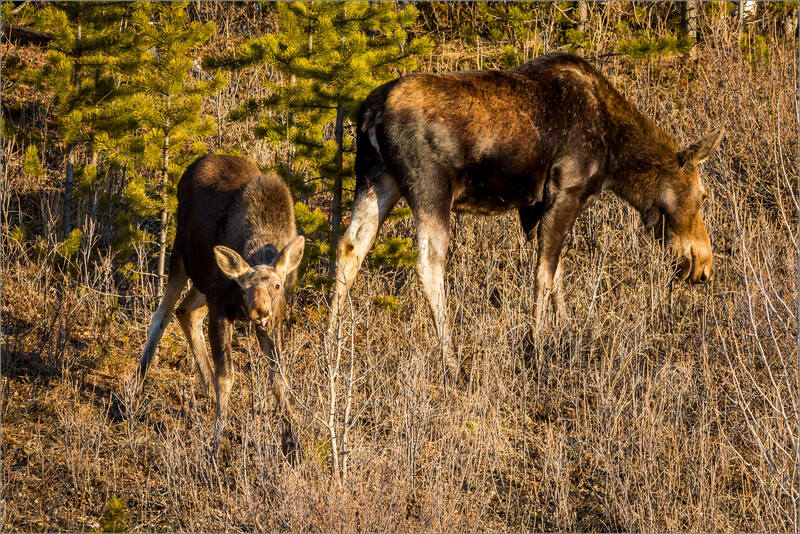 In early April I went into Kananaskis along Highway 66 from Bragg Creek. I was late getting out of bed and did not leave myself enough time to set up for a sunrise shoot. I went for a short hike around Elbow Falls but returned to my car pretty quickly. Heading back, I was scouring the hillsides and trees for wildlife. I was lucky to catch this female just as she was stepping out of the forest. 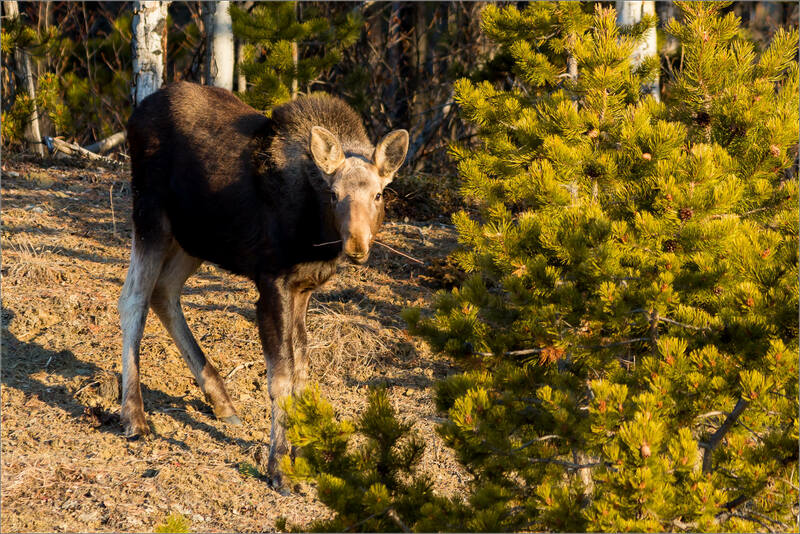 The sun hadn’t cleared the mountains across the Elbow River so the moose was not yet in the sunlight. I decided to set my camera up on my tripod and wait for a few minutes. When the sun rose over the hill, the light was soft and warm so I was quite happy to sit quietly and watch as she moved around. Patience often pays off and it was true on this occasion. 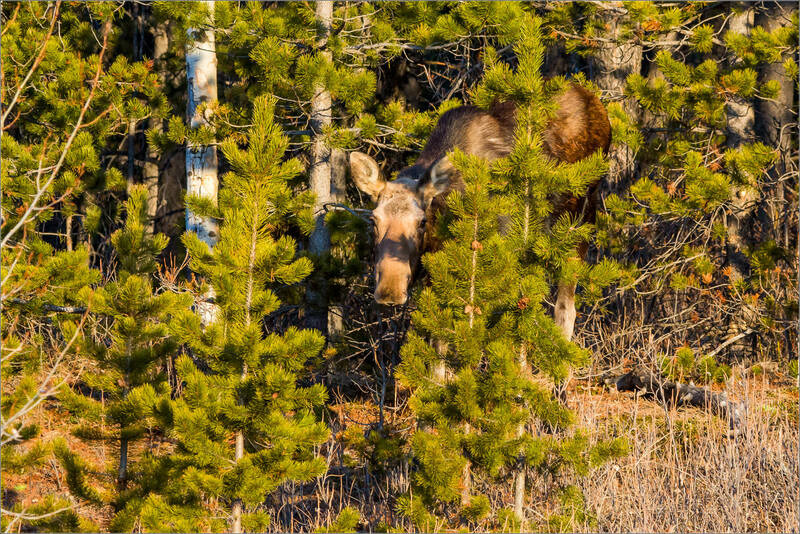 After at least fifteen minutes of watching the moose casually grazing along the slope, I heard a couple of sticks break near where she had come out from the trees before. 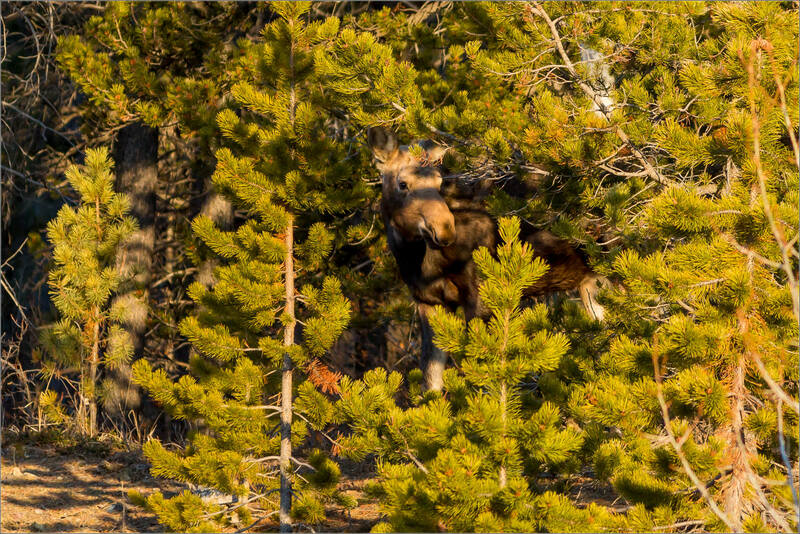 A couple of minutes after that, a calf came out onto the hillside. 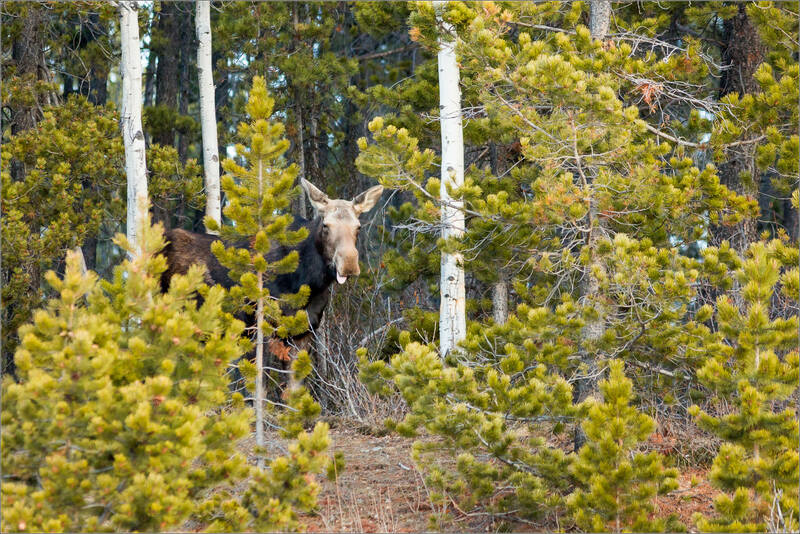 The young moose watched me with a bit of apprehension for a minute, but after a few checks with mom, started grazing and wandering around the scrub brush. The pair dined for a while occasionally eating together with mom always watchful as cars passed by or a strange sound came to her ears. They were calm and it was special to be able to watch them. I hope the buds, leaves and shoots start to grow soon so their rather austere winter diet is replaced. This entry was posted on April 25, 2014 by Christopher Martin. 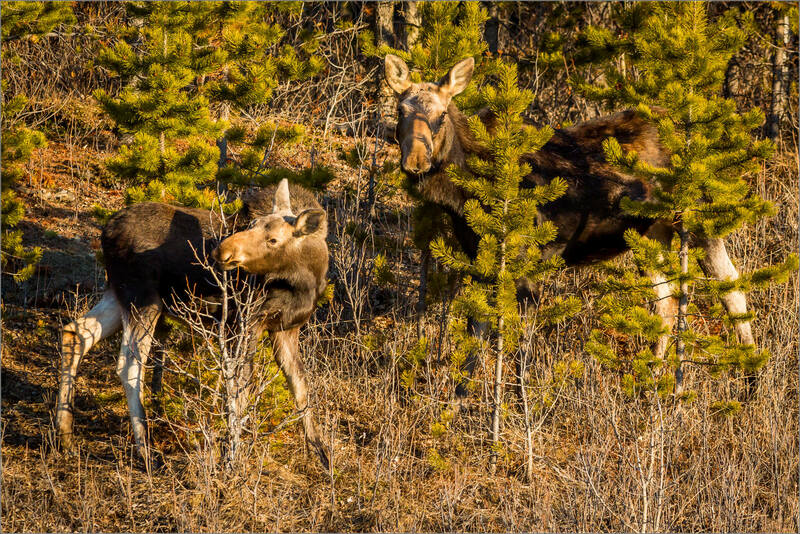 It was filed under Kananaskis, Moose, Nature, Wildlife and was tagged with alberta, alces alces, calf, Canada, Kananaskis Country, moose, mother, spring. The word splayed comes to mind…..
Lovely to see nature’s cycle and the young ‘spring’ creatures. The light really does pick up the beauty of the scenes. Love them. Thank you for posting these photos. Your morning was well spent, as always! This is absolutely stunning. You capture some of the most incredible wildlife shots. As a nature lover, I’m both jealous of your experiences and grateful to you for posting. 🙂 Keep posting for our enjoyment!